Many people wonder if it is worth insulating under floorboards and the answer is that yes, it definitely is. Insulation boards are ideal for use with electric underfloor heating as they prevent the heat from the heating system escaping downwards to the subfloor. The Warmup Insulation Boards do not let the heat pass through from the heater to the subfloor. Therefore the heat gets pushed upwards, onto the floor surface where you want the heat to go. It is recommended to always carry out a heat loss calculation if you are considering buying an electric underfloor heating system to understand how well your house is currently insulated and how big the heat loss is in your home. Many people wonder if it is worth insulating under floorboards and the answer is that yes, it definitely is. Insulation boards are ideal for use with electric underfloor heating as they prevent the heat from the heating system escaping downwards to the subfloor. The Warmup Insulation Boards do not let the heat pass through from the heater to the subfloor. Therefore the heat gets pushed upwards, onto the floor surface where you want the heat to go. It is recommended to always carry out a heat loss calculation if you are considering buying an electric underfloor heating system to understand how well your house is currently insulated and how big the heat loss is in your home. 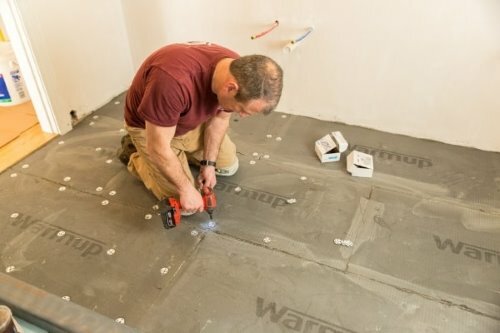 Warmup Underfloor Heating Insulation Boards are manufactured from water-resistant extruded polystyrene, finished on both faces with a thin layer of fibreglass reinforced cement. The insulation boards are available in a range of thicknesses, from 6mm to 50mm suiting any individual project requirement. The board is designed to withstand a load of 30 tonnes per square metre. The 0.5mm thick cement coating provides an excellent surface for tile adhesive, plaster and levelling compounds, with no priming required.